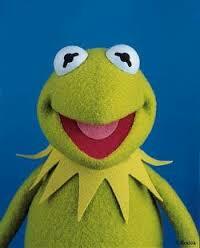 Whenever I think of Kermit the Frog, a certain song, “It’s Not Easy Being Green,”comes to mind. While Kermit is referring to the color green in his song, I am reminded of a state of being. When you are “green” at something, it often means that you are new. There are many times in life that we are put in a new situation, whether it be changing schools, joining a sports team or club, moving to a different location, starting a new job, switching careers, etc. Coming to camp for the first time may bring about feelings of being green. Being new can seem scary or challenging at first. You may be wondering if you will fit in, if the other campers will like you, if the food tastes like what you eat at home, if your bed will be comfortable, and a long list of other thoughts that may be crossing your mind in the days and weeks leading up to your first sleep-away camp experience. 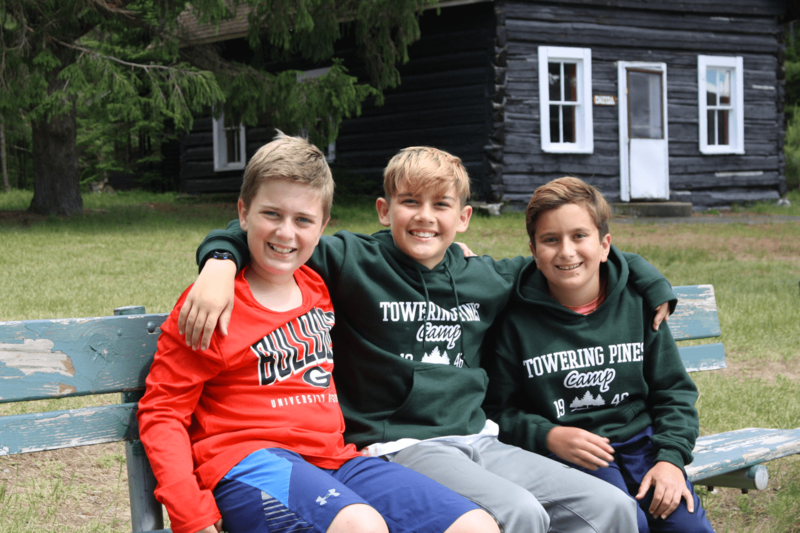 First of all, you should know that at Towering Pines, we LOVE having new campers join us each summer! It is fun to welcome boys from new places that will contribute to the diverse culture of geographic locations that are represented each year. This will add to a growing list of connections that you will make by having friends from all around the world. 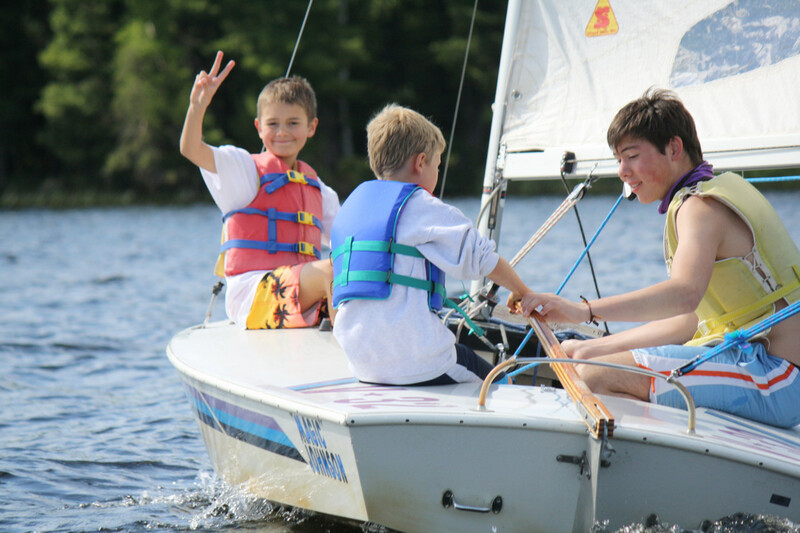 New campers bring a fresh perspective and energy that is important to the life of camp – we THRIVE because you are a VITAL part of our camp family! To help you feel comfortable in your new summer home, we have several things in place to make it easy for you to get in the groove of camp. First off, your counselors will greet you with a BIG smile and lend a hand with moving in and settling into your cabin. They will explain the routines of a typical day and will be ready to answer any questions you may have. 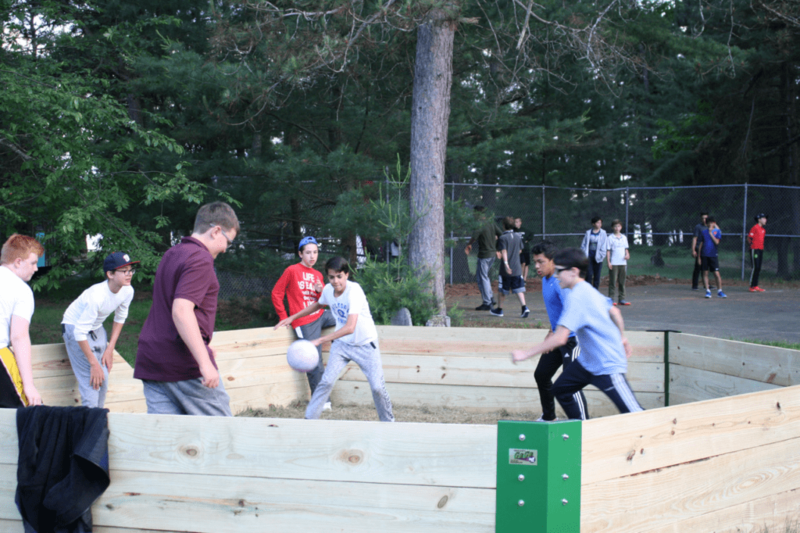 After that, you will get to play a ton of FUN games that will assist you with learning the names of the boys in your cabin and around camp. Because we are a smaller camp, it is truly a place “Where Everybody Knows Your Name” in a very short amount of time! Before selecting your activities for the first session, you will have the opportunity to take a tour and see where each takes place, meet the staff, and find out all of the cool stuff you will get to do. Evenings will offer an opportunity to do a cabin activity, be part of our weekly campfire, or take part in a workshop of your choice. The TP kitchen staff will serve up some awesome meals that will provide comfort as you spend your first few days at camp. Don’t be surprised if you ask your Mom when you return home to cook a recipe that is something new you tried at camp! 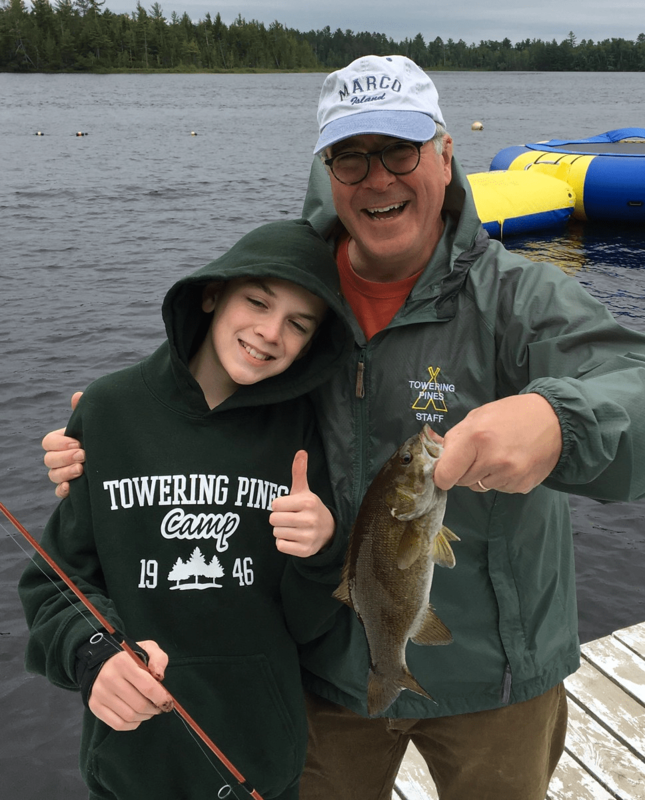 Mike LOVES to teach fishing! New can also be exciting! You will be embarking on an adventure that may be different from what your friends may choose to do this summer. 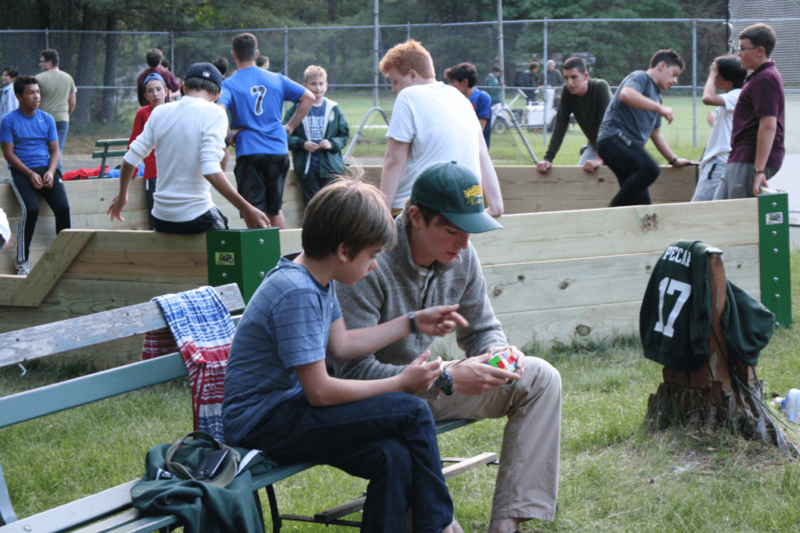 Even veteran campers experience a taste of “being green” each summer. 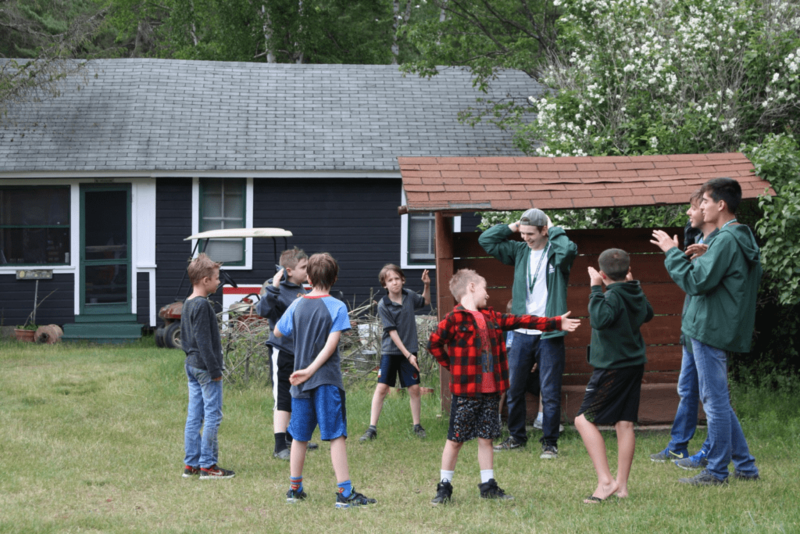 They may be in a different cabin with a new mix of campers from the year before or they may decide to try a new activity or challenge themselves in an old one. The great thing is that we are there to support each camper every step of the way. So, maybe it really IS easy being green after all at Towering Pines (and it happens to be our camp color)! Come see for yourself and join us for summer 2018…we can’t wait to meet you! Come Sail With Us…Adventures Await in 1-8!